JIM McCARTY is renowned for his innovative drumming style which he introduced into rock music as an iconic founder member of The YARDBIRDS. Jim also played with RENAISSANCE, BOX OF FROGS, SHOOT and ILLUSION and teamed up in the late 80’s with LOUIS CENNAMO (who had a prestigious career as a member of The HERD, RENAISSANCE, COLOSSEUM and STEAMHAMMER) to form STAIRWAY. STAIRWAY was an English new age band who released four albums before disbanding in 1995. Jim has now compiled a “Best Of” from those four albums. We all, in truth, need a bit of ambient in our lives. Live in the fast lane forever and it will probably be a relatively short existence unless 27 is your yardstick. Jim McCarty (founder member of the Yardbirds) and Louis Cennamo know precisely where they are. This album represents absolutely first-rate 'chill out' music and every picture does tell a story. Is a music track not a story after all? 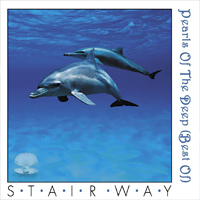 Stairway released four albums before disbanding in 1995 but featured no less than Jim McCarty (The Yardbirds) and Louis Cennamo (Renaissance, Colosseum). Originally billed as a New Age band , Stairway is mainly electronic and ambient. This is a best of the four albums and I have to say, I thoroughly enjoyed its calming, thoughtful and Tangerine Dream-esque journey. Long tracks and gentle keyboard, guitars and harmonies make for a very relaxing album. In the album opening "The Lovers" Vangelis comes to mind with its gentle electronics or even a very subdued Alan Parsons. Jane Relf's backing vocals are sublime. In "Light On A Dark Road" the peaceful acoustic guitar of Cennamo is some of the prettiest on the disc and on "Moonlight Skater" gentle flute and organ sounds accentuate an uplifting and beautiful melody. While the tunes do not differ greatly, this is one of those albums that would be perfect to drift off to. It is certainly music to ease the mind and soothe the soul. The 14 tracks are very melodic, sometimes rhythmic, and sometimes floaty. Opener 'The Lovers' pleases me at once, as do 'Looking Inside', 'Aquamarine', and 'Bird Of Paradise'. A pleasant introduction!